HA NOI (VNS) — Worried about a significant drop in agricultural exports, the Ministry of Agriculture and Rural Development (MARD) has decided to establish a steering committee that will gather information on problems faced by traders and identify possible solutions. The ministry's personnel department has been asked to set up a permanent office of the committee this month. The committee will collect regular feedback on obstacles as well as recommendations from traders of farming, seafood and forestry products, MARD Minister Cao Duc Phat said at a Monday meeting that brought together associations in the three industries. Phat said establishing the committee is one of the urgent measures being taken to deal with export challenges that the sector has faced in the first quarter of this year. 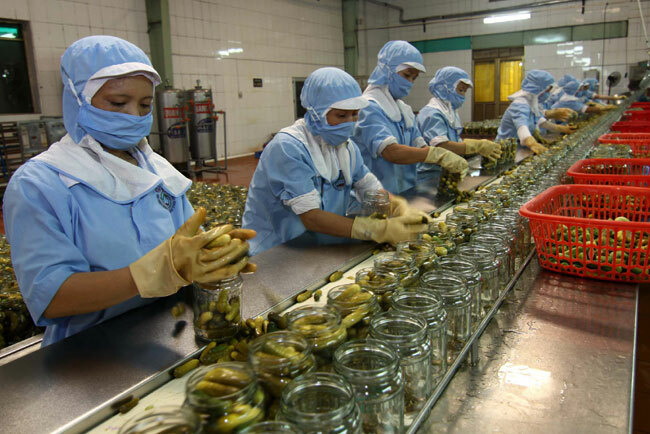 A report on the government website chinhphu.vn also said that the difficulties involved a fall in consumption demand and technical barriers in export markets that had to do with hygiene and food safety. High input costs and foreign exchange fluctuations were other challenges, it said. It cited Phat as saying that to maintain export growth, the sector should enhance trade promotion activities. He also proposed that Viet Nam's rubber associations co-operate with their counterparts in Thailand, Indonesia and Malaysia on controlling prices and volumes in the world market. The nation's coffee associations should do the same along with counterparts in Brazil, Colombia and Indonesia, he said. The onus is on Viet Nam to make this happen, he added. The Ministry as well as the farming, fisheries and forestry associations would collect recommendations on tax, land rents and transportation fees from enterprises until April 15. These will be forwarded by the Ministry to the Government, seeking solutions, Phat said. Meanwhile, the Veterinary Department, the Plant Protection Department and the National Agro, Forestry and Fisheries Quality Assurance Department (Nafiqad) have been asked to work with enterprises to reduce the time taken in carrying out import and export procedures by 50 per cent, he said. The report said that first quarter agricultural exports, including farming, fisheries and forestry products, fell by 13.2 per cent year-on-year r to US$6.13 billion. A Vietnam Television (VTV) report on Tuesday quoted Duong Phuong Thao, deputy head of the Import and Export Department under the Ministry of Industry and Trade, as saying the export value of key products including coffee, seafood and rice had fallen sharply. However, she also explained that last year's first quarter figures had suddenly increased due to advantages in export activities at that time, including high demand and low supply. "For instance, seafood exports in the first quarter of 2014 saw a sudden surge in value due to low supply of shrimp from India and Thailand as a result of diseases, and Viet Nam was able to meet the world demand. Therefore, export prices of Vietnamese shrimp increased sharply." "But, in the first quarter of this year, such advantages have been absent, and last year's growth in export value of between of 20-30 per cent could not be replicated." She said the second factor in the drop in export value was impact of foreign exchange. The US dollar had increased in value against several other currencies like the euro, yen and rouble, and exports to the EU, Japan and Russia had reduced. "If export contracts for farming products used euro and yen currencies in payment, the importers would tend to buy fewer quantities of such goods. So Russian traders will not import farm products that they have to pay for in rubles. "Meanwhile, Vietnamese exporters of farming products who'd signed contracts at the end of last year using payments in euro and yen, would be very careful in implementing them as the currencies depreciate," Thao said. An increase in the supply of products to the world market, such as shrimp from India, also affected Vietnamese exports, she added. Duong Ngoc Minh, deputy chairman of the Viet Nam Association of Seafood Exporters and Producers (VASEP), also chairman of the Hung Vuong JSC, concurred with Thao. "The export value of Vietnamese seafood reduced 25 per cent due to depreciation of yen and euro since the end of last year," Minh said cafef.vn's online dialogue on Wednesday. "Our exports have also been affected by the high supply of shrimp from India."